To be honest, planning our wedding was one of the most stressful experiences I've endured. Under ordinary circumstances, I love planning events. Growing up, my favorite part of my birthday parties was going to the party store and picking out decorations. The major problem with our wedding plans was that I was enrolled full time in Architecture school while I was planning. Anyone who has experienced Architecture School can tell you about how stressful and time consuming the program can be. Add to that lots of family problems, leadership positions, opinionated soon-to-be relatives, a tight budget, and my own control freak personality -- I was a little overwhelmed. Though Alex and I were engaged for over 2 years, aside from booking our vendors, I did most of my wedding planning in the two months prior to our wedding. Another major obstacle in my wedding plan was the fact that I love design (as I described in this post yesterday). 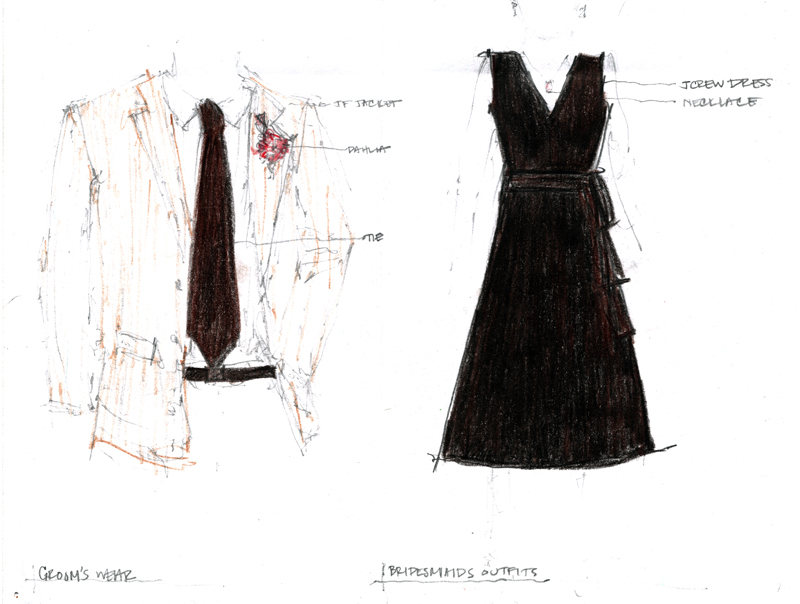 I always find it incredibly difficult to make design decisions for myself. My sisters could have killed me after taking close to a year to actually settle on a color scheme. I was also overwhelming myself with ideas from blogs like stylemepretty.com. It wasn't until about a month and half before the wedding when I finally sat down and made some serious decisions about the overall design scheme for the wedding. I don't advocate for wedding "themes" necessarily (like "Disney Princess" or "Halloween") but I think it's helpful to settle on a style you enjoy (ie: vintage, modern, rustic) or at the very least, a few elements that inspire you. Given our budget and our desire to incorporate as many eco-friendly elements as possible, our wedding design featured natural elements with a modern twist. The colors I chose for the wedding were brown and coral - inspired by some fabulous Ferragamo coral peep toe pumps I fell in love with in Italy (unfortunately, they didn't have them in my size and I haven't been able to find them since). The bridesmaids dresses we bought early on in the planning process when I spotted them on sale for a mere $70 a piece from JCrew. 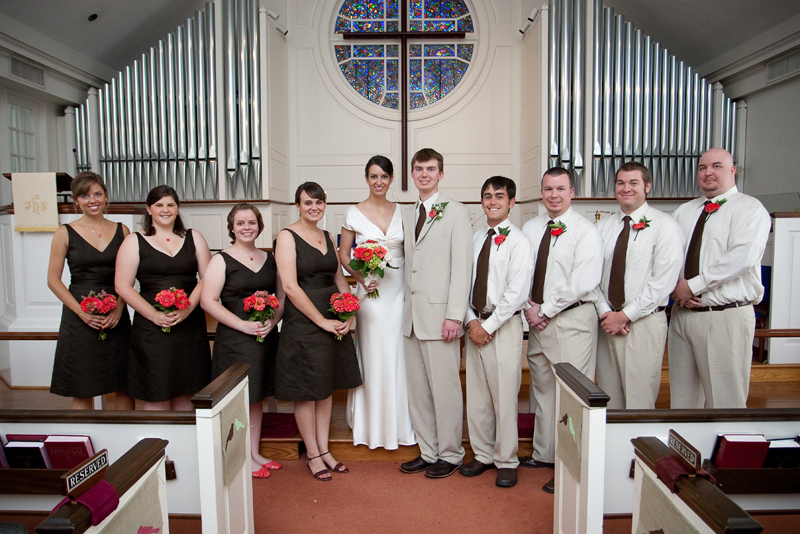 To coordinate, the groomsmen were in tan suits with brown ties. The flowers were where most of the color came in. We used coral zinnias from local farms and supplemented with roses and some greenery from Whole Foods. We arranged the flowers ourselves and wrapped the bouquets in ribbon. My bouquet was also wrapped with a piece of antique lace from my grandmother's wedding. You can see them all here. Because of the heat (and to save money), I decided to let the groomsmen go without jackets. The altar flowers were in $6 rectangular vases from Ikea (see them in my kitchen here). To coordinate with the other wedding details, we added strips of burlap and brown ribbon to the vases. We decided to incorporate a Unity Candle in our service, representing the joining of our two families. The unity candle was something we bought from a local eco-shop; it was made of soy wax and was manufactured using solar power (see it in our dining room here). In the end, this is what our altar looked like. 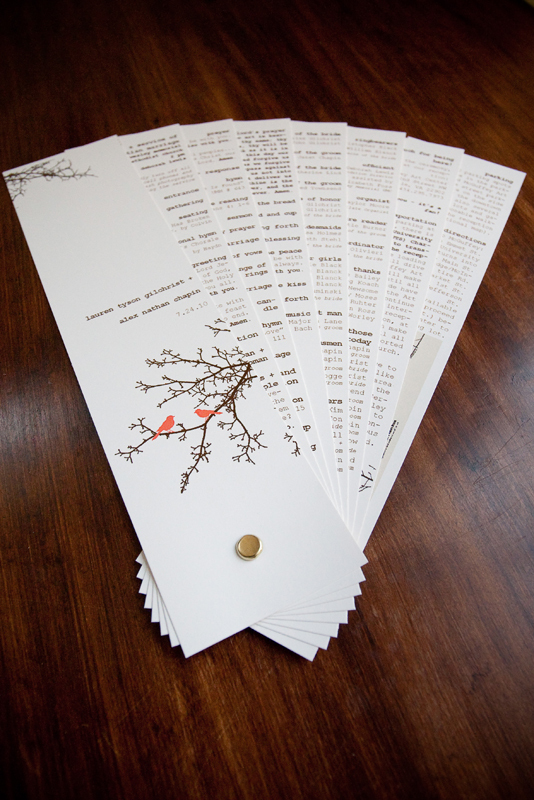 Another important design element in our wedding was the bird silhouette (I'm obsessed). It's a popular modern graphic symbol that I love these days and it fit perfectly with the eco-friendly, natural elements we incorporated. Burlap was the primary fabric for these banners that my sister, Jennifer, made. 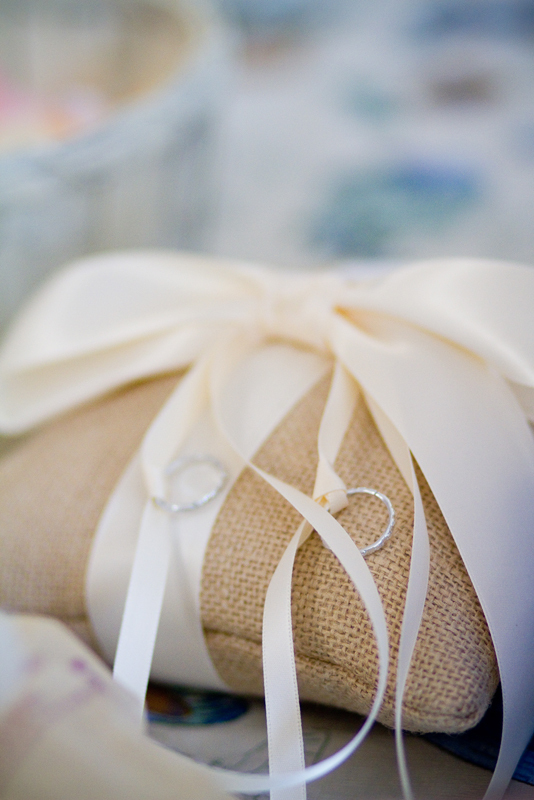 We used unbleached burlap and muslin repeatedly in our wedding decor. To save money, we only hung these banners on the first three pews reserved for close family members. For our ring bearers (we had two, absolutely adorable, handsome ring bearers), I found some pillows I liked online that incorporated burlap and asked my talented mother-in-law to make copycat versions, one for each ring bearer. She did an incredible job and even attached pretend wedding rings to each pillow (we gave the real ones to the best man and one of the maids of honor). One of the boys loved the pillow so much that he "unwrapped" it during the ceremony and used it as a pillow for his head! For the flower girls, I bought baskets from a rummage store and my sisters spray painted them and stenciled birds on them. Because we had 5 (gorgeous) flower girls, it would have cost too much to buy "flower girl baskets" from the wedding section at the craft store. I loved the end product - we filled the baskets with coral, silk rose petals and the girls got to take the baskets home as a gift (see the baskets here). For the guest book, I decided to make a "family tree." 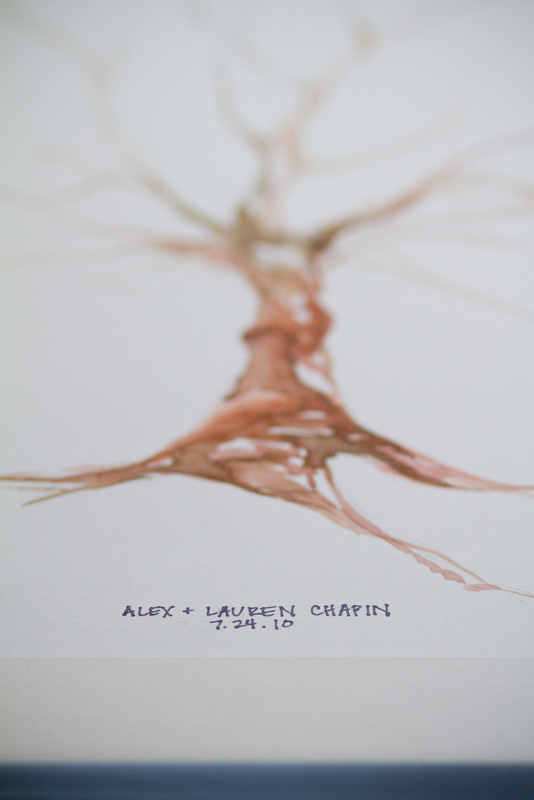 My bridesmaid, Elizabeth, who happens to be an incredibly talented, professional artist, painted a tree trunk and branches on a piece of artist quality paper. Our guests then stamped their thumb print on the tree and signed their name. We provided ink pads, hand wipes, and pens and our good friend, Meg, helped explain the process to our guests. It's now framed and hanging in our apartment (much better than a silly old book in my opinion). Finally, the programs. I actually designed these myself (with a little help from Evan, the best man). Of course, they have birds on them. They also included maps to the reception and information about the bus that we provided. I had them printed at a local print shop and cut and assembled them with help from my bridesmaid, Elizabeth. They were intended for use as fans at the reception. 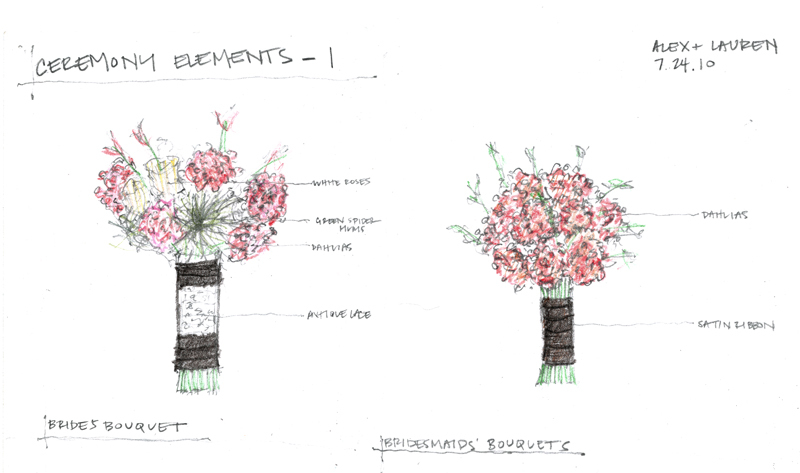 In the end, by sitting down and sketching out all of the elements, I was able to coordinate the design details and felt much better about the event design as a whole. All together, the elements not only coordinated in color, fabric, and theme, but they were each individually meaningful and budget friendly. I hope to share some more details of our reception with you soon. All photos courtesy of Ben Hallissy.